As I was setting out on my short afternoon tour through south Co Kilkenny earlier this week, it seemed a good idea to start at Ballybur Castle, the Comerford ancestral castle near Cuffesgrange, half-way between Kilkenny and Callan. 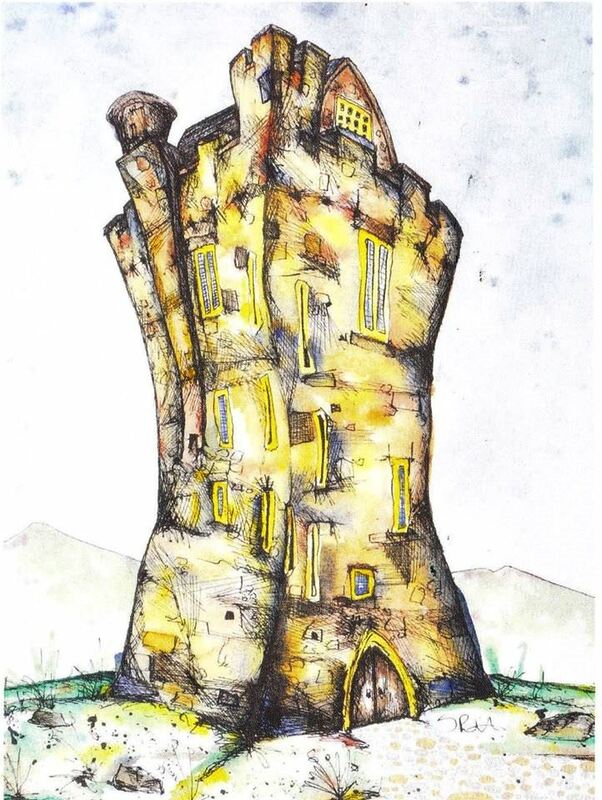 Perhaps Ballybur Castle might be better described as tower-house than a castle. It was bought in 1970s by Frank Gray and his family, and has been lovingly restored since then. I first visited Ballybur Castle in 1969, when it was inhibited by the two elderly Marnell sisters. They lived on the ground floor as everything above them became less and less inhabitable, and the castle was in a sad state of steady disrepair and decay. The restoration by the Gray family over almost half a century has to be seen to be believed, and I have been welcomed back by Frank and his family each time I return. Richard Comerford ‘Senior’ (ca 1462-ca 1532) came into possession of Ballybur, Co Kilkenny, in the early 16th century, through his marriage to Ellen Freny (or French), daughter and co-heir of Patrick fitzFulk Freny, and heiress of Ballymaclaphry and of the moiety of the manor of Ballymacogue, Co Wexford. Richard ‘Roe’ Comerford (ca 1492?-post 1537), as the eldest son and heir of Richard Comerford ‘Senior’, succeeded his father at Ballybur soon after 1532, and was living there in 1537. In turn, his son, Richard ‘Oge’ Comerford, was living at Ballybur Castle in 1566, 1567, 1571/1572, and died ca 1579-1580. Tradition says the present Ballybur Castle was built in 1588 by Richard Oge’s grandson, Richard ‘fitzThomas’ Comerford (1564-1637). Ballybur Castle was built by Richard Comerford around 1588. It was a typical fortified house built to protect the surrounding countryside against rival factions, and to keep a watch on all traffic on the roads from New Ross and Clonmel to Kilkenny on behalf of the Butlers of Ormonde. Archbishop Giovanni Battista Rinuccini stayed in Ballybur Castle on his way to Kilkenny for the Confederation in the city on 12 November 1645, and presented his rosary beads to the owner of the castle, John Comerford, who inherited Ballybur Castle from his father, Richard ‘fitzThomas’ Comerford, in 1637. They were presented to the Kilkenny Archaeological society by a descendant of John Comerford, Father Edmund Langton-Hayburn (1916-2006), who lived in Freemont, California, and are kept in Rothe House. My Comerford ancestors lived in the castle came to an end in 1654 when John Comerford was forced to leave during the Cromwellian era. He was compensated with lands near Bunratty in Co Clare, but he never recovered Ballybur Castle or his estates after the Caroline Restoration, despite appeals to his wife’s cousin, the Duke of Ormonde. Ballybur was acquired by Brian Mansergh during the Cromwellian land distribution. His descendants include Senator Martin Mansergh, a political adviser to successive Taoisigh and a key figure in the peace negotiations in Northern Ireland. In 1725, George Mansergh was living at Ballybur Castle. In 1769, Michael Deignan was living at Ballybur Castle, probably as a tenant of the Mansergh family. Colonel Richard St George Mansergh added the name St George to his family when he inherited his maternal uncle’s property. In 1836, Richard Mansergh St George owned Ballybur Castle. The castle passed from the Manserghs to the Deignan family at this time, and Thomas Deignan was living in Ballybur Castle in 1841. It later passed by marriage to the Marnell family, who lived there until the mid-1970s. The last three people to live there were Margaret, Tommy and Eileen Marnell, who are remembered fondly in the locality. Nicholas Marnell is believed to have been the last person born in the castle. He put it for sale in 1979, when it was bought by Frank and Aifric Gray for £20,000. Ballybur Castle is a five-storey keep measuring 38 ft by 30 ft at the base and it stands 65 ft tall. The windows are narrow, but the deeply angled window sills make the rooms brighter than visitors might expect. Compared with other similar square tower houses, Ballybur has larger rooms and a wider stairs than most. The ground floor was originally used to store goods, but also people and livestock in times of danger. It now has a fully-fitted kitchen, with every modern convenience that you would find at home. Outside the back door, there is a secluded south-facing patio area with a large fireplace for a BBQ or open fires and garden furniture. The first floor consists of an immense bedroom with a four-poster bed and niches in the walls for sleeping. There is also a smaller double room and an elegant bathroom that has a large Victorian bath. On the second floor, there is a substantial room with more deep niches in the walls once used for beds. During the daytime these niches were covered by hanging tapestries and the room was used as a living space. Now this floor is a huge double height dining room, with an enormous chandelier hanging down in the centre. The room has a mediaeval stone fireplace for big blazing fires, a long dining table with church pews for large dinners and seating up to 12 people. Off this room there is a comfortable bedroom with two beds and windows overlooking the castle grounds. This floor also has a smaller kitchen for preparing light meals. This kitchen is fitted with a sink, oven grill, microwave and is stocked with crockery, cutlery, glasses, etc. There is also an elegant shower room with a toilet, shower and hand basin. The third floor, with its vaulted ceiling, has a bedroom that was once the private chapel of the Comerford family, and it is said that Cardinal Rinucinni said Mass here when he stayed at Ballybur Castle. This floor also has a shower room with toilet and sink. From a little balcony you can peep through a narrow doorway down into the dining room. All the beds in the castle have orthopaedic mattresses, electric blankets, duvets with covers and feathered cushions for a snug and deep sleep. The castle is also fitted with Victorian cast-iron radiators installed. The fourth and top floor was once the “state apartment” and is now a magnificent baronial-style drawing room. The room has an oak beamed ceiling that has been left exposed, a huge stone fireplace and another giant chandelier. There are several lounge seats, a table and chairs, and a handcrafted swing in one of the alcoves. Heavy curtains must make the room very cosy in the evenings. The four windows, each facing the cardinal points offer magnificent views. High above, at the top of this room, a stained glass window is a testament to Nicholas Marnell and his promise to his forbearers that he would hand over the castle to someone who would show it the love it needed to be brilliant again. The artist is Shane Grincell, Tommy Marnell’s grandson. Off this room, a secret room has a deep floorshaft, which was used as a “priests’ hole” for hiding visiting priests after the Reformation or to keep prisoners. A smaller flight of stairs leads up to the ramparts, and on clear days I have had views that stretch as far as Mount Leinster and Slievenamon. Ballybur Castle is now a luxury self-catering holiday home and it can be rented for self-catering holidays throughout the year, for long weekends or a whole week, although longer lettings are also possible. Visitors have exclusive use of the castle which comfortably sleeps eight people and can cater for up to 12. Full catering and cleaning can also be provided. Ballybur Castle caters for a variety of events, and is an ideal location for special occasions, such as weddings, honeymoons, corporate functions or gala dinners. Is Bray the Italian culinary capital of Ireland?